This entry was posted in Branding, Consumer Products, Marketing and tagged addict, coffee, latte, Starbucks by RepMan. Bookmark the permalink. Starbucks just warned that their Q2 earnings are not going to be good. This is likely a direct result of the economy but still, expensive coffee is going to be tough for the American consumer to swallow for some time. Cheap is now in vogue and Starbucks is far from cheap. Nice analysis, Caroline. 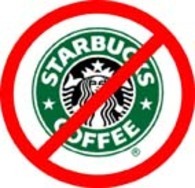 I agree that Starbucks has lost its mojo as a ‘cool site’ to ‘chill.’ Before they can regain it, however, they need to first figure out how to fend off McDonald’s and others who are now making serious inroads. Btw, I’m hearing great things about Mickey D’s coffee. I still can’t see myself buying coffee at McDonald’s though. I think that you have a great point about the company being “too big and cumbersome” to save themselves from the harsh economic situation they are in. My personal thoughts are that just like any trend these days, it is slowly dwindling out. Back when coffee shops became so popular, it was because they were a third type of meeting place or hang out spot that was not work or the house. But today, maybe coffee shops aren’t as popular social hangouts as they first were. However, you can’t say Starbucks hasn’t tried anything special to increase profits. Rehiring their CEO and then holding a “Nationwide Training Day” was pretty risky. However, it accomplished one of its goals of generating quite the buzz and bringing attention to the fact that the company still values employee training for a better customer experience. I personally do not necessarily believe that they have seen such a downturn in profit because of lack of personal engagement or baristas failing to consistently make “the perfect drink.” I think that you touched on the fact that financial analysts everywhere, when giving advice on how to save, consistently mention cutting out that morning latte because that $3.50 you spend each morning can really add up.